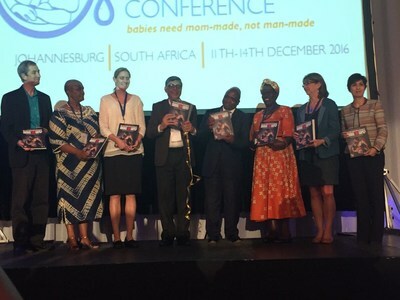 On the occasion of IBFAN's Second World Breastfeeding Conference Dr. M.J Phaahla, Deputy Minister of Health, Government of the Republic of South Africa, today released International Baby Food Action Network's (IBFAN) new global report: "Has Your Nation Done Enough to Bridge the Gaps? : 84 country report on status and progress of implementation of the Global Strategy for Infant and Young Child Feeding2008-2016". The report shows that despite the undisputed evidence that infant mortality could be reduced by 1.3 times if all women breastfed their babies within the first hour of birth, only half of all newborns in the 80 countries reviewed are breastfed. The study was done using the World Breastfeeding Trends Initiative (WBTi),IBFAN's break- through innovative tool that measures the state of policy and programmes in countries. The lead author of the report, Dr. Arun Gupta, said "Infant feeding during emergencies is given the worst coding: Red with a score of just 3.4 out of 10. It is a grossly neglected area where nations have failed to pay attention to preparedness, failing to integrate prevention strategies - that must include breastfeeding protection and support - into normal public health programmes. This leaves the door wide open for the baby food industry to intervene with quick fixes that further exploit infant's and mother's vulnerabilities." The report also has a barometer that measures baby-friendly hospitals despite the importance of this 25 year initiative, only 42 countries have achieved baby friendly status in their hospitals and only half of the hospitals in these countries are classified as being truly 'baby friendly'. This indicator has a direct link to the rates of early initiation of breastfeeding. Weak implementation of the International Code of Marketing of Breastmilk Substitutes is a glaring gap in almost all countries. It has been legislated in only half the countries and very few have adopted all the relevant subsequent WHA resolutions. According to Patti Rundall of Baby Milk Action UK, "The continued aggressive marketing of the baby food industry misleads and confuses parents, and is a major threat to breastfeeding. The report highlights the urgent action that governments need to take to end inappropriate marketing of all products targeting babies as specified in the latest resolution and guidance from WHO. Indeed unless action is taken the formula market will as predicted rise by 55% from US$45 billion to US$70 billion by 2019. The report also shows a profound lack of support for women. An indicator which measures Maternity Protection Finds that only 10% of countries provide more than 26 weeks of maternity leave. Women in the unorganized and informal sector, which form 90% of the working women, are neglected on maternity protection by 77% (64) countries. Child-care facilities at work are absent, with only 46 countries providing this benefit. It should be no surprise that only 37% mothers are able to exclusively breastfeed in 84 countries when maternity protection - the most critical intervention for the success of exclusive breastfeeding - is missing. The report states that while 68 out of 84 countries report having a policy and 59 have a comprehensive plan, only24 countries have adequate funding for the plan. UNICEF Senior Nutrition Advisor, France Bégin says "What stands out clearly from the report is that countries are not investing sufficient resources to implement the Global strategy. Despite the evidence that investing in breastfeeding is one of the most cost effective public health interventions available, insufficient priority is being given to this, which put infants and children at risk of reaching their full potential…"
"The report clearly demonstrates that while progress has been made in many countries, no country has fully implemented the Global Strategy . Gaps are particularly apparent in the protection of breastfeeding in emergency situations and in the implementation of the Baby Friendly Hospital Initiative." Said Francesco Branca, Director, Nutrition for Health and Development, W.H.O., Geneva. The World Health Assembly has set a target for 2025 to increase exclusive breastfeeding rates from 37% to at least 50%. The World Bank has estimated that an investment of $5.7 billion for low and middle income countries in next 10 years will be needed to achieve this. However, it could bring high economic returns: $35 for every dollar invested. Such an investment could ensure that 105 million more babies are exclusively breastfed, and save 520,000 lives. The five countries that would benefit most are India, Pakistan, Nigeria, Democratic Republic of Congo, and Ethiopia. For maternity benefits, an additional $24 billion from other sectors would be required, according to the World Bank. Bad diet is now acknowledged to be the biggest cause of death and disability and the costs of diet-related diseases are fast consuming health budgets. IBFAN calls upon World Health Assembly Member States to adopt a resolution to call for a "budget line" for Breastfeeding and Infant and Young Child Feeding interventions in child health and/or nutrition, with a clear plan of action and timelines that is reported to the World Health Assembly every two years. Also, all governments, agencies, donors should invest in these interventions to bridge the gaps shown in the policy at national level urgently to enable women to breastfeed and foster improved child development globally. ICDC Focus: aggressive Promotion: Growing Up Milks http://www.babymilkaction.org/wp-content/uploads/2014/10/GUMs-NEW.2016.pdf.